These cupcakes would be a nice dessert after a romantic dinner. 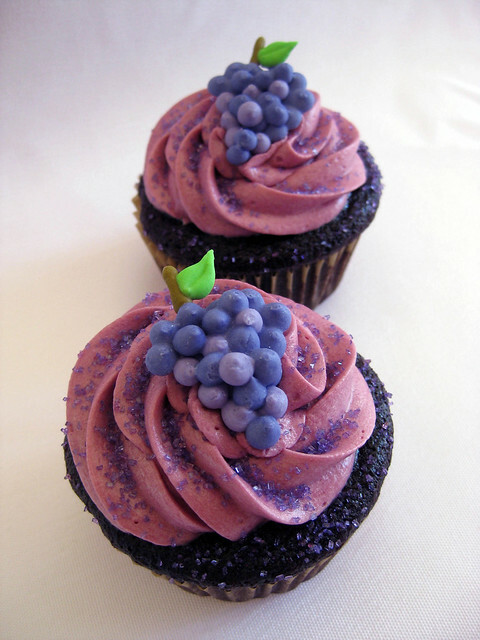 Karen of Cupcake Queen made these chocolate cupcakes with red wine buttercream frosting topped with royal icing grapes. The cake recipe is from gluten-free cupcakes (Elana's Pantry). She replaced a third of the agave with reduced red wine and sugar. Frosting recipe from Sprinkle Bakes. The royal icing recipe from Martha Stewart’s Cupcakes (amzn.to/15LPBzu).